GameChangerWorldPA is a 20,000 Sq. Ft. food, drink and entertainment complex located in Allentown, Pennsylvania. 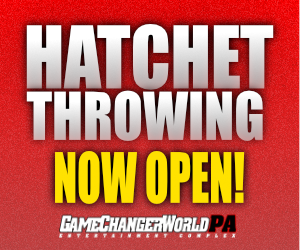 GameChangerWorld features a state of the art entertainment center, traditional and modern, high tech arcade, rock wall, half court basketball, mechanical bull, axe throwing, and the best live entertainment in the Lehigh Valley. The entertainment complex and Taters Half Baked Restaurant and Bar will host weekly live entertainment, performances, events and so much more. GameChangerWorld is home to the "BEST BIRTHDAY" experience, for both adults and children and is available for private, corporate and fund raising events. From incredible Sweet 16's, to 40/50 year young celebrations & retirements, GCWPA provides the most unique parties, leaving the guests with lifetime memories. Our children birthday party packages offer "stress free" party planning, zero clean up, with the only responsibility being that of a cake and candles to the party parents/hosts. GameChangerWorldPA features TATERS HALF BAKED RESTAURANT AND BAR - This "comfort joint" offers a tasty menu of recipes featured on Food Network's hit series, "Diners, Drive-Ins and Dives." Tater's Half Baked features a creative decor with a unique copper top bar. Themed table tops and appearances by GCWPA's friendly parrot, Woodstock. Weekly specials, incredible Happy Hour and rumors circle about a secret menu. Vintage and Classic Arcade games, pool table, jukebox, Chexx Bubble Hockey all are housed in Tater, with live music Thursdays and Fridays. The BEST burgers & wings in the Lehigh Vallley. Our facility is available for private parties, birthday, retirement, corporate, fund raising, reunions, camps, schools and all organizations. We offer group package rates and team building programs. Want to work at GameChangerWorldPA? We are always looking for fun individuals to welcome into our family and facility. If you would like to work in a fun, creative and entertainment environment, please send us an email. You must be at least 15 years and have a work permit from your school guidance department to work here at GameChangerWorld. We are hiring for party hosts, arcade staff, waiters/waitress, bartender and maintenance. Band Booking - Want to Perform at GameChangerWorldPA?